LIFE IS WEIRD. Nothing gives you a sense of perspective like finding out just how weird. I’m an extremely curious chap and with this book I wanted to share the content of my noggin, because I think these are the 147 things that have helped me through this thing we call life. Sometimes because it shows how lucky we are to be here at all, but often because I’m a moron and learned whatever lesson it taught me the hard way, and I’d like to save you the pain of making the same mistakes (I refer here to the waxing of my pubic hair). Ever wondered if first times are over-rated (hint: they are), whether you’ll ever find the one (hint: there are 7 billion of us) or pondered the sheer unlikelihood of the you who is you being in the world right now? 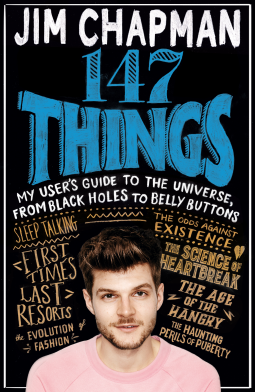 If so, then YouTube superstar and fact-obsessed, over-sharer Jim Chapman is here to explain it all – whether it’s why your heart actually aches after a break-up, what’s happening when you get hangry, or why people are just so plain RUDE online. Along the way, we’ll find out how much fun he has when Tanya’s sleep-talking and why he looked like a gangly T-rex with wonky teeth when he was a teenager. As with his videos, no subject is off-limits, as Jim lifts the lid on his life and his relationships, sharing embarrassing stories and things he’s learnt along the way (trust us, the thing about kangaroos will really freak you out). I received a copy of this ebook from Pan Macmillian in exchange for an honest review. You’ve probably heard of Jim Chapman from various Youtube channels; He co-runs The Lean Machines, appeared on Zoella videos and his sisters videos who also are a big Youtube name, Pixiwoo. I wasn’t entirely sure how this book would be formatted, from the book description I was thinking 147 things that helped or related to his own life, but the book has lots of random facts in them and a few stories about the facts relating to him. I didn’t read every single fact because some of them went on for a few pages and I wasn’t too interested in them, but I told my partner a few of the facts and he found them interesting (he likes to tell me random facts about things as well). I liked the drawings in the book, they were simple drawings but relating to the facts. If you like learning a few random facts about the world and life then give this book a go!